Only $12.95/child. Admission must be prepaid. It's an Easter Egg Hunt with a twist! 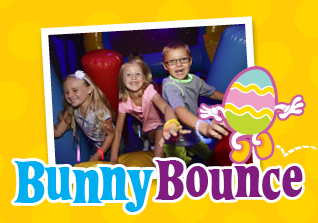 Bring the whole family for a day of bouncing with a new twist on the traditional egg hunt and a special visit from a really big bunny! - BounceU’s one-of-a-kind egg hunt. Be on the lookout for special eggs as you could win a big prize!